For bloggers, October is the kindest month. First, there’s a wealth of Halloween material to play with, so you can do posts like this and like that. And second, Orbit Media Studios used this month to release its annual Blogger Survey. 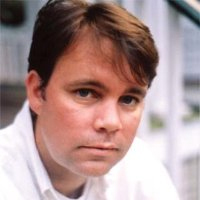 Content quality is growing increasingly important. The power of frequency shouldn’t be overlooked. Promoting content is essential — with paid promotion becoming increasingly common. In 2017, bloggers are now spending almost 40% more time on a typical blog post than they did three years ago. 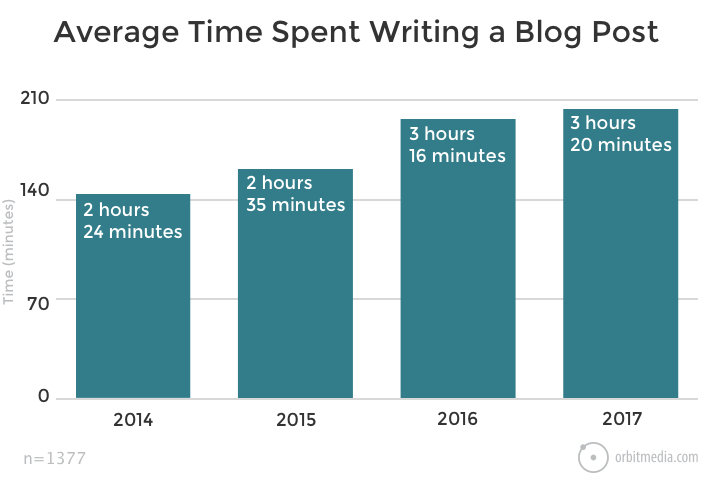 In 2014, just 5% of bloggers spent six or more hours in creating a blog post; now, bloggers investing that much time on their posts has increased by about 150%. Another stat from the survey also indicates that creating quality posts is more important: The average blog post is now more than 1,100 words long, which is 41% longer than three years ago. Bloggers are writing longer posts, and they aren’t filling the posts filler: The best long posts are packed with useful information. This approach appears to be working. 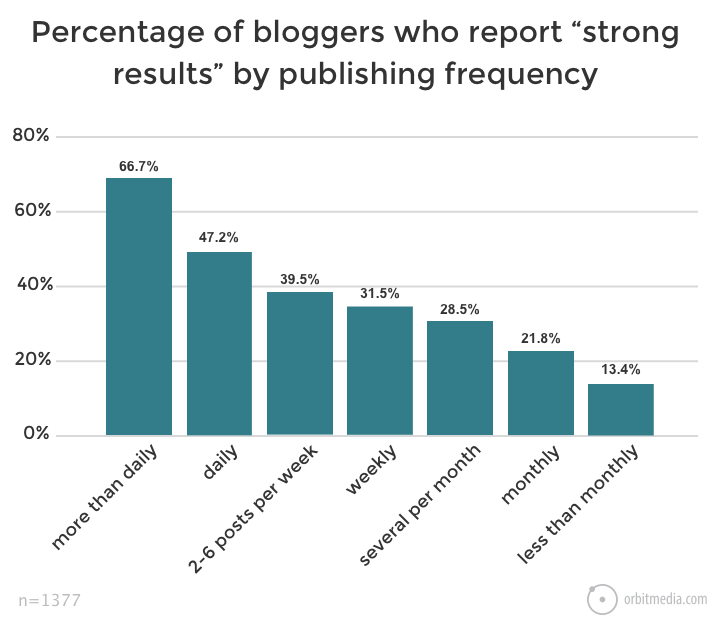 “Bloggers who write big posts are twice as likely to report strong results,” Crestodina writes. As bloggers spend more time creating posts, it stands to reason that the frequency of blog posts would drop — and in fact is has. Orbit’s survey did find that publishing frequency for individual bloggers is in decline. The most common response for publishing frequency this year was “several per month.” Two years ago, the most common response was “2-6 times per week,” according to Orbit’s survey. But while the pursuit of quality may lead do a dip in quantity of posts, that doesn’t necessarily mean that it should. Orbit’s survey data indicates that blogging frequency tends to correlate strongly with success in content marketing. “Bloggers who publish more often are far more likely to get results,” Crestodina wrote. (But he cautioned that frequency may be only one factor in success; bloggers who publish frequency also may be more likely to use analytics, to use advanced SEO tactics, and pay to promote their posts). So if the choice is quantity or quality, the answer should be both. The B2B Beat is a long-time believer in frequency for many reasons, not the least of which is an enhanced capacity to experiment with and test new kinds of posts that may perform surprisingly well. Creating quality blog posts is half the battle. The other half is getting people to read them, and for that, promotion is increasingly required. And oftentimes, promoting blog posts mean paying. Orbit Media has found that paid content promotion has increased almost five-fold since 2014. Beyond paying for ads, bloggers are also investing in other marketing techniques to promote their content. About 25% of bloggers are collaborating with influencers, which often comes with a price tag. Almost two of every three bloggers is paying attention to SEO, which also tends to require investment. At the same time, 42% of bloggers are still not using email marketing to promote their content, Orbit’s survey found. The survey indicated that bloggers who invest in difficult marketing techniques, such as SEO and email — both of which are harder and require more investment than simply posting on Facebook — tend to be stronger performers. 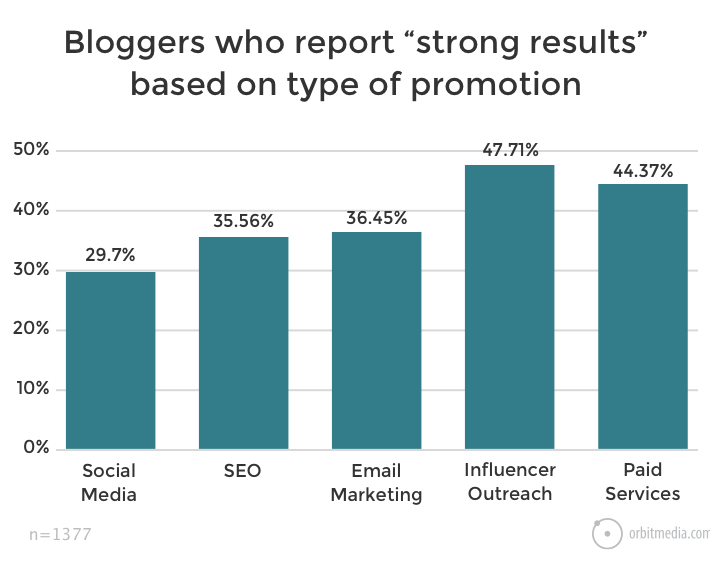 Only 3% of bloggers using paid promotion said they delivered weak results. “Greater investment leads to better results,” Crestodina wrote. The Orbit Media survey makes the path clear for 2018 for any blogger. Publish quality posts. Publish them often. And promote them with a budget and with a vengeance. To keep pace with the fast-changing world of digital marketing, subscribe to this blog — the LinkedIn Marketing Blog — today.